Review posted November 28, 2018. A Paula Wiseman Book, Simon & Schuster Books for Young Readers, 2016. 36 pages. Despite the title and look, this is not, actually, a Jon Klassen book. It is a whole lot of fun! As the book opens we see a big dark cave with two red eyes peering out. Theodore lived in a cave. and that's the way he liked it. One morning, a bird flew up to the cave. It tweeted and squawked at Theodore. Does it want me to eat it? 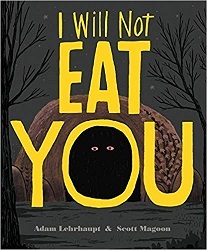 "I will not eat you." The same pattern repeats with slight variations as the day progresses with a wolf and a tiger. That evening, a boy wearing a suit of armor gallops up to the cave and roars. The boy doesn't back down, and Theodore emerges from the cave. We finally see that he's an enormous red dragon. He chases the boy! Things could get pretty grim, but in a surprise for everyone, the two end up sharing a laugh and becoming friends. I'm not sure it's a healthy situation for the boy, but by the end of the book, they play together regularly. This book would be a hit with preschoolers. There aren't a lot of words on each page. I think the hint of danger could be thrilling. There are certainly plenty of things to talk about after the story is done. Would you play with Theodore?